Butler students pose outside the United States Supreme Court in Washington. Photo from Sarah Wede. 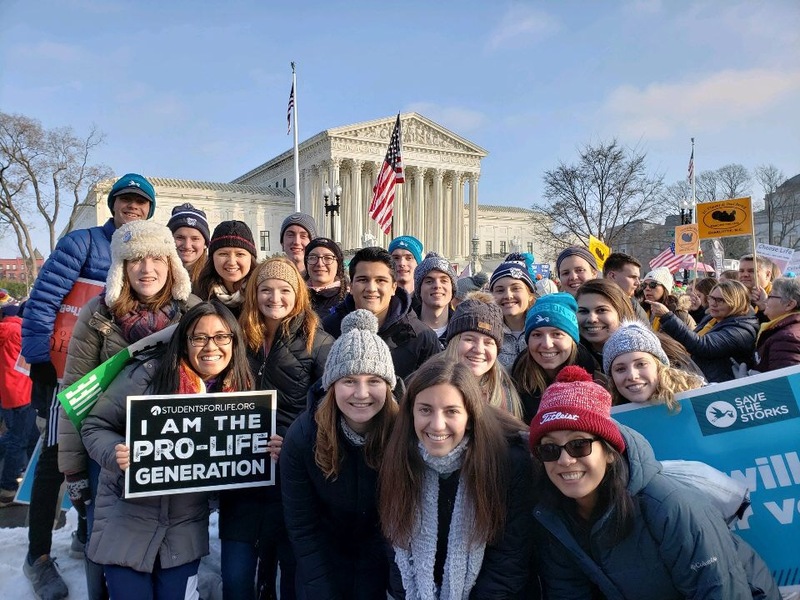 Butler students took to the streets of Washington, D.C. at the annual March for Life on Jan. 18. Twenty-one Butler students traveled with students from Indiana University-Bloomington and Marian University. About 150 students total took charter buses to show their support for the pro-life movement, the stance against abortions. Students arrived on the morning of Jan. 18 and visited the Basilica of the National Shrine of the Immaculate Conception. After the service, students could listen to speakers or explore D.C.
Sarah Wede, a junior pharmacy major and vice president of Butler Bulldogs for Life, has attended the march for four consecutive years. She said every year she has felt an extremely loving atmosphere, and speakers have offered insight on how to approach the topic of abortion on campus and beyond. Wede also said she would like to see more open conversations on campus. Junior biology major, Emily Weiler, attended the march for the first time this year. She is not a member of Butler Bulldogs for Life, but decided to go to express her views. She said it was something she’d always wanted to do. “It was super eye opening and super humbling to see the amount of people that were there, which I was surprised about,” Weiler said. Weiler also said she learned from the march. Grace Jackson, a first-year political science major, said she identifies herself as pro-choice, or someone who advocates for the legalization of abortion. Although Jackson is pro-choice, she said she supports the freedom to express your own opinion. Jackson said she is not against pro-life, but said she believes women should make the choice for themselves. Claudia Gruett, a sophomore instrumental music education major, attended the march in Indianapolis this year. Gruett said about 500 people marched in downtown Indianapolis. Sean O’Brien, a junior psychology and pre-med major, said he attended the event for the first time which further solidified his stance on what it means to be pro-life. O’Brien also said it can be challenging to have these conversations as a man. “I know a lot of people, especially on the pro-choice side, say this is no place for a man’s opinion, but I still think the issue is relevant to everyone,” O’Brien said.